​Still flying high from their appearance on NBC's The Sing-Off, Street Corner Renaissance bring their smooth singing style to the El Campanil Theatre. Not just another vocal group, Street Corner Renaissance are cultural ambassadors, breathing new life into classic doo-wop music. The quintet performs a tribute to Sam Cooke, a rousing gospel celebration, a civil rights anthem and more, their superb harmonies standing out in all the material they take on. 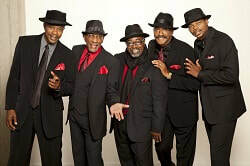 Led by NAACP Award winner Maurice Kitchen, Street Corner Renaissance has opened for Chuck Berry, Kool and the Gang, Boyz II Men and many more top acts. You can buy tickets for NO additional fees at the box office. If you choose to order by phone, the convenience fee is $2 for the entire order. the convenience fee is $1.50 per ticket.